… or how I dodged half of the Spanish fishing fleet! 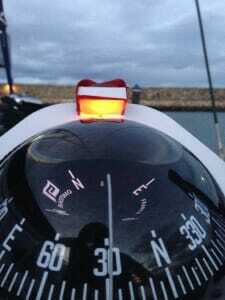 Since we left La Rochelle at 4pm on Saturday, the 60 hours we were using for passage planning meant that we were going to arrive in A Coruña early in the morning while it was still dark. While not ideal (and something I don’t plan on repeating on a regular basis), the entrance into A Coruña is wide open with no tricky obstacles to avoid. We consulted our charts and Google Earth and determined that the risk of entering during the dark was minimal and would be preferred to our two other options. One: slowing down the boat while on passage or Two: kill time outside the harbor until it was light outside. The first option would have been tricky since we were already significantly under canvassed and needed to run our engines to get their hours up. When we approached the coast of Spain, the appearance of the fishing fleets at almost exactly 00:01 (I’m convinced Dec 1st marked the start of a new fishing season) made staying outside and dodging them for hours a very unappealing option. As it was, I counted 16 vessels on the AIS that were designated as “Fishing” and had to dodge about half of them as they were coming out of their harbors. (Yes, I know this is not “half” of the entire Spanish fishing fleet, but it sure felt like it that early in the morning) I’m convinced this is what caused a few of the “were you drunk driving?” comments. And for the record, no I was not. We have Volvo D2-55 engines on Starry Horizons and they require their first servicing at about 50 hours of use. That’s what makes A Coruña a great first port of call. By using our engines (mostly one at a time) during the entire crossing of the Bay of Biscay, we had enough hours on them to get them serviced. The marina we’re staying at (Marina Coruña) has a sister marina (Marina Seca) that does all the service and technical work. So pretty much immediately after we checked in to Marina Coruña, we motored over to Marina Seca to get the engines serviced. It was a pretty simple process involving an oil change, and changing oil and fuel filters. We had all the necessary items on board to do the service ourselves, but Volvo requires the first servicing to be done at a certified facility. Now that this is out of the way, I can do the general maintenance on the engines myself. The biggest issue we had during our crossing was that we experienced significant chafing on our auto 1st reef line. In order to be conservative, we put one reef in the main during our first night, even though winds were forecasted to be light. 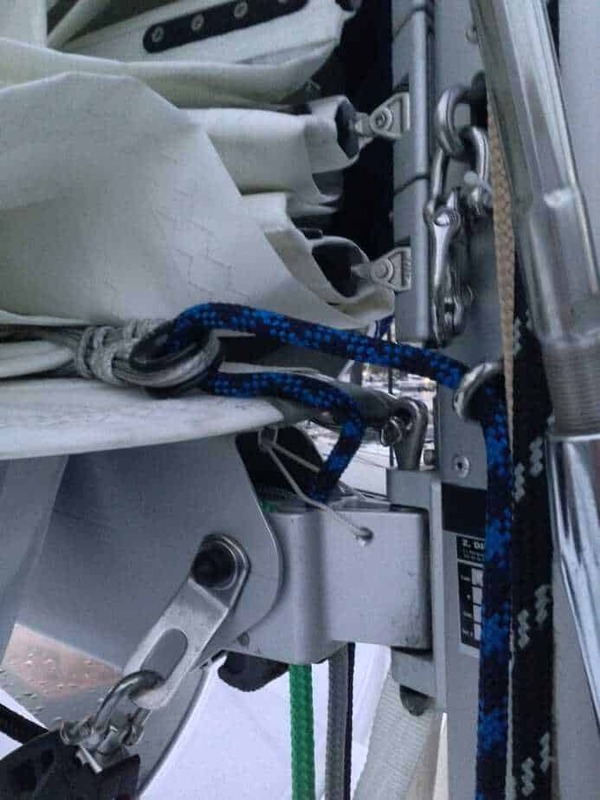 During the night, as I was checking on things, we noticed that the line was chafing at the gooseneck so we dropped the main and actually didn’t use it the rest of the trip. Thanks to our many friends who sent pictures of setups on other Helias, I believe I know what happened. 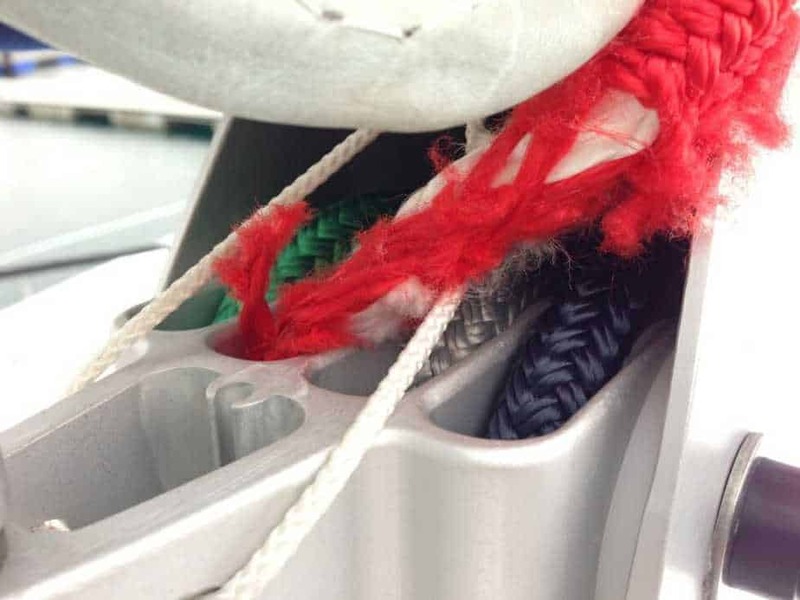 When the boat comes from the factory, the auto reef line is lead straight from the sheave in the boom, up the starboard side of the sail to the reef point on the main, and then back down the mast to the blocks leading back to the helm. 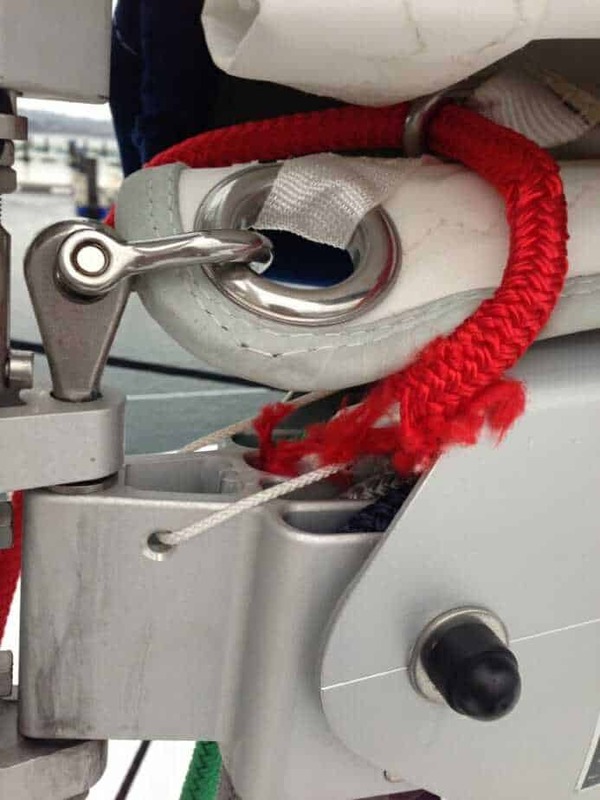 In La Rochelle, we had Incidences Sails re-rig our main with their square top attachment method and when they re-rigged everything, they ran the 1st reef line around to the port side of the mainsail, which resulted in it rubbing quite severely on the small white line which attaches the sailbag to the boom. So while our engines were being serviced, we had a rigger out to the boat who replaced the 1st reef line with something that will hopefully be a bit more chafe resistant. He and I also talked about different ways to rig things, but for the time being I went back to the factory method. Believe me, I’ll be keeping a very close eye on things! I also found a great chandlery here in A Coruña called Pombo and they were able to help me find a Wichard FRX Ring to replace the shackle used by the factory for the 1st reef point, as well as some 5mm Dyneema line I used to lash the ring to the sail. This should help reduce friction in the system and hopefully make it a bit easier to reef the main. During our crossing, our Vesper AIS would occasionally lose it’s GPS fix due to lack of signal. I have the neat Vesper Marine app on my iPhone which allows you to see the signal strength from the satellites in view. Believing that the internal GPS on the Watchmate unit was too hidden inside the boat to have a clear view of the sky (signal would have to come down through the bimini, through our forward windows and down into the nav station housing), we wanted to install a dedicated antenna that would help boost the signal. As it turns out, all that was needed was a simple external antenna that we’ve routed to be a bit more forward in the salon, which brings it out from under the bimini. Signal strength seems much improved, which is good as I’d sure hate to lose signal as we are crossing all the commercial traffic heading into/out of the Med on our next passage south. We rely on our Iridium satellite phone as our primary “long distance” communicate device. It allows us to make calls and download emails, which include GRIB files and weather forecasts. Needless to say, its an important piece of equipment on board. During our first passage it worked fairly well, but we suffered through some periods of dropped signal, which made downloading emails a difficult experience. 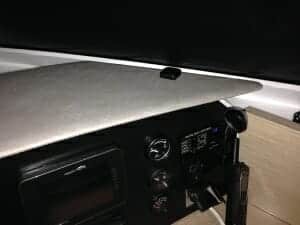 Again, I think the satellite phone suffered from some of the same issues as the AIS since the small Iridium antenna that came with the phone was mounted under our bimini on top of our nav station. To increase the strength of our signal, we had someone come out and install an Iridium antenna on our spreaders and run a cable down to the nav station so we could connect the phone. The early results are positive and we’ll continue to evaluate as we keep sailing. Cleaning Supplies: I noticed a few rust spots on the gelcoat from where little metal shavings had fallen to the deck and wanted to get something to clean them up. Pombo recommended a good cleaning agent (Star Brite Hull Cleaner) and also had a stiff brush to help scrub the deck. The rust spots seemed to come right up so hopefully we’ll now be able to keep Starry Horizons looking impeccable! Red Electrical Tape: This one seems kind of silly, but the compass at the helm station has a light that is extremely bright at night. So much so that it was ruining our night vision. My first attempted fix was to put white electrical tape over it, but even with 3 layers, it was still too bright and that much tape caused the cover of the compass to be difficult to close. So I got some red electrical tape and will try that instead. 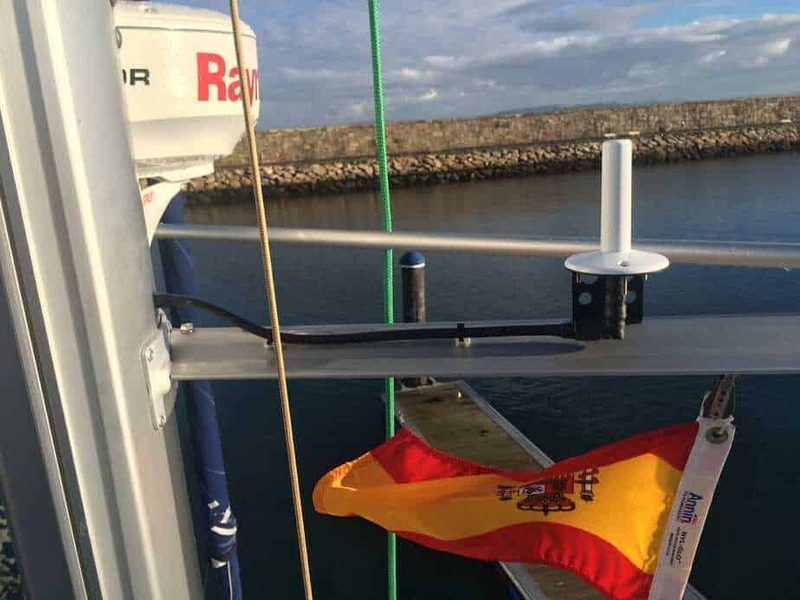 At the moment we are going through our departure checklist again as with all these projects now being finished, it looks like we will have a good weather window to leave for the Canary Islands tomorrow! I find myself thankful for all those cruises in Galveston Bay as dealing will all those lights was definitely good preparation! Thanks! And now we leave again… 🙂 This time for warmer climates! I thought AIS could share a masthead antenna with the VHF? So many small items that you could never have anticipated until you put them into full time practice. You are correct that for the VHF signal the AIS can share a masthead antenna. What we were having issues with was the GPS fix for our AIS so the antenna we added was a GPS antenna. I’ve updated the blog post to be a bit more clear. I continue to learn from your experiences. Your enthusiasm will carry you through the tough times. Love your posts!! We will be looking forward to having you visit Gary!